This method is concerned with analyzing the influence the random vector has on a random variable which is being studied for uncertainty (see also [sobol1993]). Here we attempt to evaluate the part of variance of due to the different components . We denote G the physical model such as . Let us consider first the case where is of dimension 1.
are the first order sensitivity indices and measure the impact of in the variance , are the second order sensitivity indices and measure the impact of the interaction of and in the variance . where is the part of variance of that do not countain the i-th variable. Each line is a realization of the random vector. The purpose is to mix these two samples to get an estimate of the sensitivities. The implemented second order indices use this formula. Aggregated second order indices have not been implemented. Note finally that the distribution of indices can be computed for first and total order thanks to the getFirstOrderIndicesDistribution() and getTotalOrderIndicesDistribution() methods. This can be done either by bootstrap or using an asymptotic estimator, this behavior can be changed using setUseAsymptoticDistribution(). 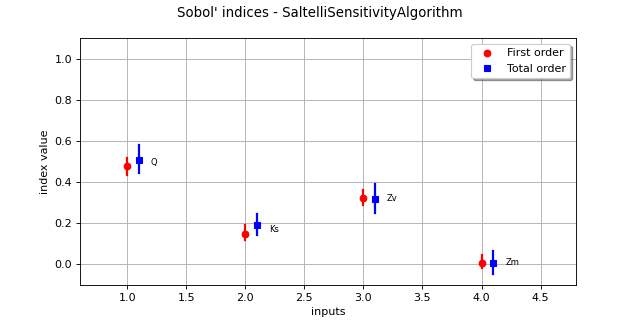 Its value in initialized by the SobolIndicesAlgorithm-DefaultUseAsymptoticDistribution resourcemap key. For the bootstrap method the size is set by setBootstrapSize() values and initialized by SobolIndicesAlgorithm-DefaultBootstrapSize resourcemap key. The asymptotic estimator of the variance are computed using the [janon2014] delta method, in the technical report [pmfre01116]. The corresponding confidence interval is also provided using getFirstOrderIndicesInterval() and getTotalOrderIndicesInterval(). 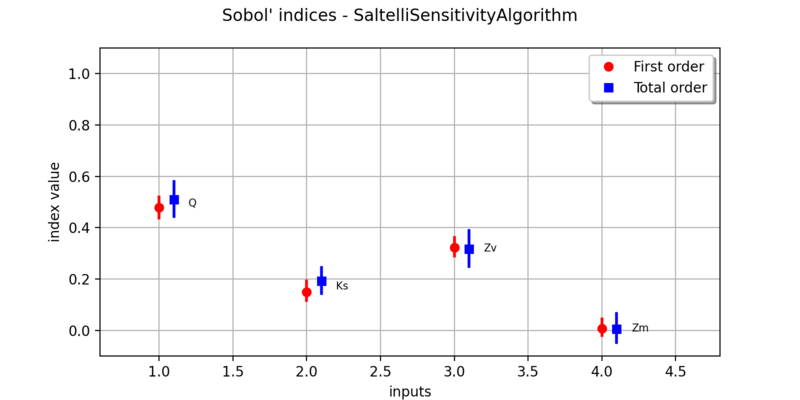 The confidence level is set by setConfidenceLevel and is initialized by the SobolIndicesAlgorithm-DefaultConfidenceLevel resourcemap key.